Tencent has added or rather introduced PUBG Prime and Prime Plus subscriptions for mobile players on both Android and iOS. 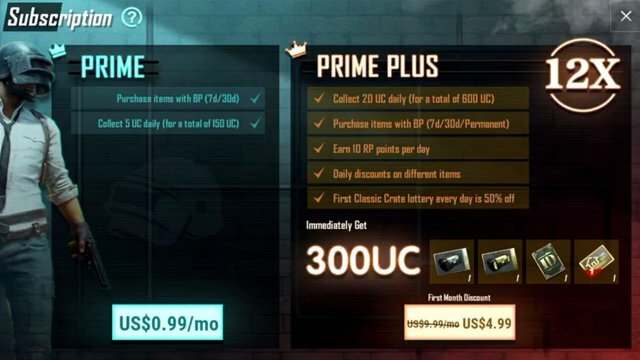 These subscription models give avid players a daily boost of Unknown Cash or UC, discounts on crates, and give players the ability to make in-game purchases with Battle Points (BP). The two tiers naturally give players different benefits, with the basic $0.99 tier giving players 5 Unknown Coins daily and purchases using Battle Points. The Prime Plus tier is priced at $9.99 — but is on offer for $4.99 per month at present — and includes a lot more benefits for the avid player. This tier gives players up to 20 Unknown Coins daily alongside the ability to make purchases using Battle Points, it also gives daily discounts on in-game loot and items, while simultaneously giving players 10 RP points per day. Not only that but players get a discount of 50% for entry into the Classic Crate Lottery each day. It’s highly unlikely that PUBG Prime is worth investing in for casual players, but for avid PUBG Mobile players, this might be a worthwhile investment. It’s worth noting that you can buy both subscriptions at once — or so it seems. Given the benefits of the Prime Plus option over the standard Prime, that wouldn’t be a wise investment.